This is a short story about three images from my collection and how they came to be. It’s the kind of article I enjoy reading about my favourite photographs by other photographers but rarely see. 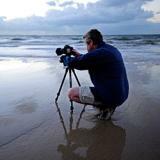 As a photographer, it's always interesting to know what camera settings were used to capture a particular image, but it can be even more interesting and enlightening to learn something about the journey that led to capture of the image – what brought the photographer to that particular location at that particular time, what planning was undertaken, what difficulties were overcome. I know from my own experiences that some images just seem to fall into your lap when you're least expecting it, but most are the end point of a sometimes convoluted path involving an assortment of physical and mental obstacles. These three images are important to me not so much because I think they are particularly great photos – although I do quite like them – but more because of the journey that led to their capture and the point they mark in my progression in learning how to take better landscape shots. More than anything, these shots are continual reminder to me of why I do what I do. 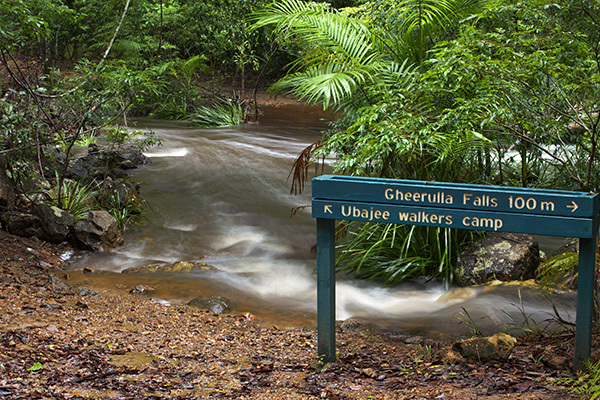 I first visited Gibraltar Range National Park in 2008. I'd read about it before and seen pictures of it and the nearby Washpool National Park, but family and work commitments had pushed photography, hiking and other hobbies firmly into the background. When I did finally take leave from work my main aim was to just get away from it all and walk in some wild country rather than chase photos. But I never go anywhere like this without a camera – my kit at the time consisted solely of a waterproof Olympus compact that I could slip into my pocket and not have to worry about getting wet or dirty. My old Canon film SLR was mostly relegated to the cupboard and I hadn't yet entered the world of digital SLRs. 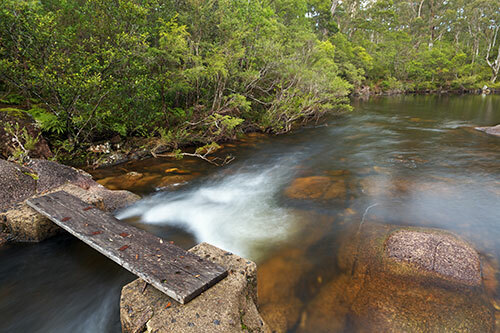 Gibraltar Range National Park is located high in the Great Dividing Range of New South Wales, between the coastal plains of the mighty Clarence River and the New England Tableland. 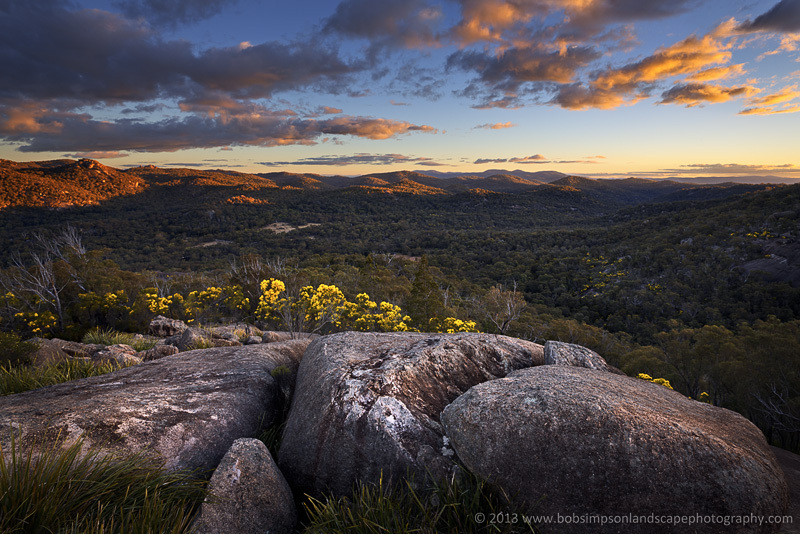 The typical landscape in the park includes dry woodlands and open heathlands, broken by craggy outcrops and huge granite boulders, but pockets of rainforest and wet eucalypt forest add variety and complexity to the local ecosystem. The rushing waters of Little Dandahra Creek and Dandahra Creek cut through the middle of the park before spilling over the escarpment on their way to joining the Mann and eventually the Clarence Rivers. I remember arriving at the Mulligans Hut camping area for the first time – it was a cold August afternoon and there was only one other hardy family braving the conditions. They left the next day and I had the park to myself. The first night was particularly cold – by the time the sun went down I had a raging fire and all my warm clothes on but it was still a struggle to stay warm. The temperature dropped below -5C during the night so the only warm place was deep inside my sleeping bag. Early the next morning I loaded up my day pack and headed off on a journey of discovery – first to the Needles, a series of craggy outcrops overlooking the deep Dandahra Creek gorge, and then on to the lush Tree Fern Forest with its majestic stand of Sydney blue gums and magical understorey of tree ferns. Sitting on the edge of the forest for a cup of tea and bite to eat, I couldn't help but burst out in a big grin at the new treasures I'd just discovered . This was truly a wild and beautiful landscape and for now it was all mine. The two hour return hike across rocky ridges, past unexpected cascades and eventually along the course of Little Dandahra Creek went by in a flash as I fell into the pace of the land. Next morning I took the short drive back to the head of the Dandahra Crags trail and set off on the 6 km circuit walk that skirts around the edge of Surveyors Swamp. The open swampy heathlands of Gibraltar Range are a defining feature of the park – expansive fields of red and gold reeds, fringed by low banksias sporting their colourful flower spikes, provide a wonderful contrast to the forested areas. The Crags trail winds through open woodland beside the swamp and past massive boulders and rock outcrops. Twenty minutes into the walk the looming presence of the Crags begins to appear through the trees, before a short side trail leads off to the left and on to an easy scramble up on to one of the rocky tors. The views down over Surveyors Swamp and beyond, and to the wild Mann River gorge area to the south east are just breathtaking. My little Olympus compact takes quite good shots and I spent several hours shooting from every conceivable angle and just taking in the views over a cup of coffee. The walk back around the western side of the swamp provides lovely views across a field of richly coloured swamp grasses back towards the Crags and I quickly filled the remaining space on my camera's memory card. There were lots more discoveries over the next few days, but the Dandahra Crags area had really fired my imagination. Back at work a week later, I spent way too much time staring into the photos from the trip and dreaming about being back there. The only thing about my shots, which started out as a minor annoyance and grew into a major disappointment, was that I knew with a better camera and more time I could do a lot better. It was the shots of the Crags and the swamp below that most gnawed at me – my snapshots had captured enough of the rugged and vibrant beauty of the area to transport me back there at a glance, but my compositions were a little haphazard, the light was not as good as it could have been, and the lens on my little Olympus hadn't produced the crisp, clear detail I wanted to see. That episode was one of the main factors that resparked my obsession with photography. Over the next two years I entered the digital photography age properly and started plotting how to make it a central part of my life. 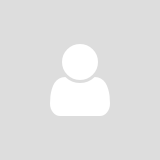 Late in 2009 the plan started to fall into place when I lodged my application to take 7 months off work on long service leave – that was granted and later extended with another 6 months of unpaid leave. Over the autumn and winter of 2010 I visited National Parks across southern Queensland and northern New South Wales learning how to use my new Canon DSLR, but the first and most satisfying adventure was the return to Gibraltar Range. With several target photos etched into my mind, it was hard not to break into a run on the hike back to the Dandahra Crags. My very first visit back there before dawn on a cool July morning produced Surveyors Swamp with the little banksia in the foreground. In fact it was the second shot of the morning – the first was a landscape of the same scene, but the portrait format worked better. It took me some time searching around in the half light to find this view where I could isolate a single banksia shrub against a backdrop of swamp grasses and the Crags. One of the overriding memories from my earlier trip was the vibrant colour of the swamp in full sunlight – this shot was taken too early in the day for any direct sunlight, but the combination of the pre-dawn glow and the diffusing effect of a light mist over the swamp have produced lovely deep, rich tones in the vegetation. For Surveyors Swamp, I set the shutter to bulb mode with an aperture of f14 and ISO 100. From my earlier test shot I estimated that I'd need a shutter speed of around one minute to properly expose the scene. So with my zoom lens set at 17mm and a 1-stop graduated neutral density filter attached, I pressed the remote release button and held my breath as my watch's second hand completed its circuit. A quick check of the histogram to make sure everything was fine and I moved on. In retrospect, a darker ND grad would have been more appropriate, and I ended up having to relatively darken the sky some more in post-processing. Half an hour later I climbed up onto the Crags hoping for same sweeping shots down over the countryside while the sun was still low, but a heavy morning mist crept up the valley and obliterated any views for several hours. Persevering with the conditions, I managed to capture my next worthwhile photo of the area, Mist on Dandahra Crags, in between periods of almost zero visibility. The deep cleft in the rock that is a central feature of the shot is less than a metre wide, but I recall that jumping across it to reach the southern part of the Crags made my heart skip a beat – the thought of falling down there and becoming completely stuck where it narrowed towards the bottom wasn't that appealing. After a somewhat half-hearted shot in landscape format, I switched the camera around to portrait just as the swirling mist cleared a little to show the rocky peaks in the background. 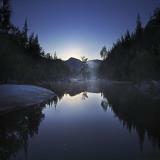 For this shot, the camera was set to aperture priority mode at f13, ISO 100 and a focal length of 17mm. Because of the moisture in the air I had done away with the ND grads – fine mist was settling on the front and back of the filters in the holder and it was a constant job to pull them out and wipe them down. Instead, I bracketed three shots with the darkest set at 1.7 stops darker than the exposure reading from the rocks. Again I could have afforded to go a little darker, but this was close enough to allow a simple blend of exposures later in post-processing to bring the sky in line with the foreground. I used the brightest of the three bracketed shots to bring up the exposure in parts of the foreground. The shutter speeds for the three shots were 0.4, 1/8 and 1/25 second. 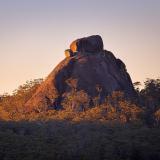 The opportunity to catch a sunrise view from the Dandahra Crags down over Surveyors Swamp came about on my next trip to Gibraltar Range in August. Winter was well and truly established and I'd spent several mornings shooting heavy frosts in the more exposed parts of the National Park – the iced-over puddles and grass that crunched when you walked on it took me back to my schooldays in Victoria, but it was a far cry from my last 20 years in sub-tropical Queensland. One afternoon I took a leisurely walk to the Crags to spend some time searching for compositions that I could put to use the next morning. Sunrise was a better option than sunset for the view to the north-east I wanted to capture. After some careful scrambling around on the boulders, I picked out a couple of spots, took some test shots, and fine-tuned the compositions – and importantly, made some mental notes as to the best route through the boulders to get to my chosen spots in the dark the next morning. The 4am alarm on my mobile phone wasn't needed – I was awake and ready to go at 3.30. The thermometer outside my tent was sitting on -3C as I tucked into a quick bowl of cold cereal and a hot coffee. After scraping the ice off the windscreen, I jumped into my car for the 10 minute drive to the head of the trail. A heavy frost had settled on exposed parts of the track and the short grass crunched with every step. Twenty five minutes later with the sun still well below the horizon, I started the easy scramble up onto the Crags and found the route I'd mentally mapped out the day before. A final climb up onto the flat boulder that would give me a clear view down over the swamp and out came the camera and tripod. I have to say I prefer photographing landscapes at sunrise rather than sunset – everything seems more vibrant and fresh first thing in the morning, but that is probably partly down to my own body clock that has always kicked me into gear around daybreak. By late afternoon I'm usually ready to settle back and relax, especially when I'm out camping. As landscape photographers on a mission to make the most of our time on location, the aim is to be out shooting at dawn, dusk, and as often in between as possible. I subscribe to that approach in theory, but there has to be some balance. One of the great joys of landscape photography is spending time in the best office in the world, but any office can become a bore if the time spent in it is all hard work. All I'm getting at here is that you need to take the time to enjoy what you're doing – if that means feverishly taking photos every waking moment then that's fine. I'm most happy putting in a big effort first thing in the morning, scouting around during the day for opportunities, eating well and maybe even sitting back at camp and reading a book, then heading out for a low key session in the late afternoon close to camp. It's not just the amount of time you spend taking photographs that will help you achieve your goals, it's also about finding a balance and using your time effectively. With a chilly breeze on my face, I framed up and fired off a test shot. The sky was completely cloud-free – not ideal but not bad either – and the frosty white crust on Surveyors Swamp showed clearly through the dim pre-dawn light. Another fifteen minutes and the first golden rays began to pick out the tops of the forested hills that surround the swamp. This is the most exhilarating time of day for me and often has me contemplating the immense time-scale involved in shaping the landscape and the people who might have sat in the same spot tens of thousands of years before to witness the very same spectacle. I waited until the sun's rays reached down to light the two grass trees in front of me and fired off a series of bracketed shots. At my chosen aperture of f16 and ISO of 100, the camera's exposure meter recommended a shutter speed of 1 second. 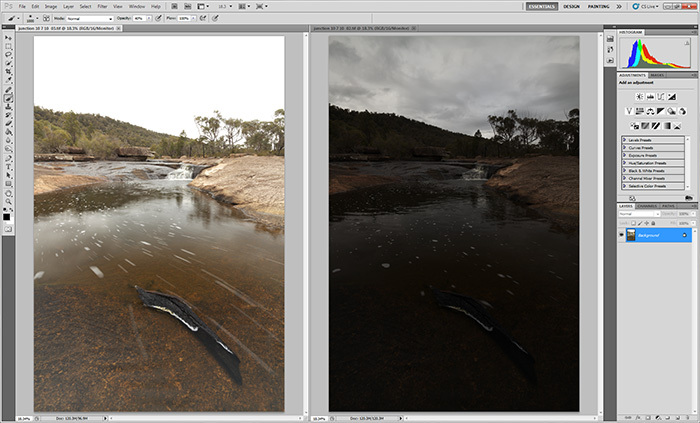 Using this as a guide, I set the exposure bracketing to +/- 1.7 stops to cover the dynamic range of the scene. The histograms confirmed that these exposures were adequate, so after refocussing and taking some duplicate shots just to be sure, I moved on to look for other shots. I visited the Dandahra Crags and Surveyors Swamp several more times on that trip and since, and have racked up quite a collection of photographs of the area. I’ve also had it in my mind for some time that a heavy coating of frost on Surveyors Swamp would provide some great photo opportunities, but despite several early morning hikes with this aim in mind, the shots I want are still eluding me. And now that winter has passed for another year, it will be well into 2011 before I can give it another try – but try again I certainly will. That’s one of the things about landscape photography that I really love – no matter how well you think you know a place and how often you’ve photographed it, there are always other compositions, other subjects, and different lighting conditions waiting there for your next visit. Repeatedly visiting the same area can seem like a bit of a bore, but every visit is an opportunity to open up new levels of understanding about the nature of the place and to chase new photo ideas that only arise through familiarity with the subject. So that's about it – these three images are still right up there among my favourites, not so much because they are brilliantly composed or expertly processed – I know they could be better – but because of how they came about and how they've inspired me to learn and progress. At the time I felt that these shots marked a major step forward for me, and I still look at them with some affection for that reason. All three are now big framed prints hanging on my wall. Every photographer will have their own little milestones that mark attainment of a new level of understanding or proficiency – they crop up right throughout a career. It's worth recognising and celebrating them often to remind yourself of the journey so far.